Common wisdom has it that for a TV to grab the public eye these days it needs to be Full HD and stunningly designed. But Panasonic's TX-32LXD85 is neither of these things. So, what's this TV's pulling power? Its resolution is resolutely HD Ready at 1366 x 768 pixels and its design nothing new. But ignore this TV at your own lookout. For starters, at £700, it's attractively priced for a 32in Panasonic LCD TV. Secondly, it's well-connected for its money, with three HDMI (v1.3) inputs, a PC port and an SD card slot for digital photo playback. The feature count is also decent, numbering noise reduction routines; colour management; a light detection system for auto-adjusting pictures based on the amount of light in your room; and, best of all, a potentially killer processing combination of 100Hz (to make movement smoother and sharper) and Panasonic's impressive V-Real 3 system (for improving contrast, colours, fine detail levels and noise levels). Handily, the combination of V-Real Pro 3 and a dynamic backlight system helps the TX-32LXD85 claim a seriously appealing contrast ratio of 10,000:1. We put the TX-32LXD85 through its paces with a Blu-ray disc of Tim Burton's musical gore-fest Sweeney Todd: The Demon Barber of Fleet Street. 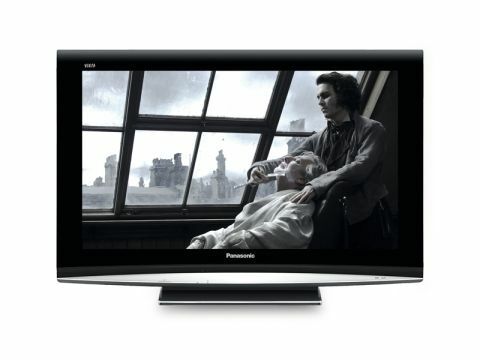 And perhaps predictably given Panasonic's recent multiple TV successes, it performed superbly. Despite 'only' having an HD Ready resolution, the TX-32LXD85 reproduces impressive amounts of the impeccable detail levels present in the Sweeney Todd Blu-ray transfer. You can make out every bit of stubble on Judge Turpin's face as he settles down for his fateful shave, for instance. The Victorian streets of London also look terrifically detailed, sharp and three dimensional. The clarity on show is all the more eye-catching because it's unaccompanied by such common noise types as dot crawl or grain - a talent for which we doubtless owe much to the V-Real Pro 3 processing engine. We admit that Sweeney Todd is not a particularly bright film. So it's just as well that the TX-32LXD85's black levels are impressive, rendering the blackness of London's night skies with bags of depth, tonal accuracy and precious little of LCD technology's once-common problem with grey misting. Apart from blood red, the colour palette of Sweeney Todd is deliberately subdued - something that can throw up some tricky skin tones for flat TVs to handle. But the TX-32LXD85 handles pretty much every skin tone thrown at it with aplomb, while also bursting into life for the film's rare excursions into bright, colourful material. With Panasonic's 100Hz engine also helping motion on the look sharp and smooth, we're fast running out of areas to find fault with this TV. The only minor complaints we can raise are that, occasionally, a particularly bright, fast-moving edge can flicker slightly and that 24fps playback could be a touch smoother. Other than that, it's all good: even audio shapes up pretty well, compared with the slightly lame efforts that have previously existed at this level of Panasonic TV. In other words, if you'd rather save a few bob than get hung up on Full HD, the Panasonic TX-32LXD85 will is pretty much spot on.